We Muslims believe in all sacred books. Why do not you, Christians, believe the Koran? Jesus-Islam » The Koran » We Muslims believe in all sacred books. Why do not you, Christians, believe the Koran? The reason is quite simple. 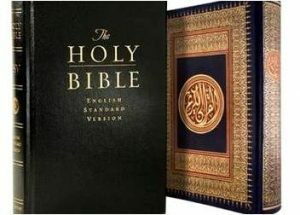 I believe the Bible is the complete, infallible and inspired word of God as you believe the Koran to be. If, as I said, I accept that the Bible is complete, then, as a matter of fact’ I have to reject any other later revelation. This will necessarily include not only the Koran, but also the Book of Mormons and any other supposed extra revelation. From the moment that I also came to believe that the Bible is infallible, I could only reject everything that contradicts or differs from it. The four Gospels (Matthew, Mark, Luke and John) of the Bible declare that Jesus died on the cross, that He was buried, and that He rose again on the third day. These statements (or declarations) are confirmed by the first Epistle of Paul to the Corinthians. The Bible also teaches that salvation is obtained through grace through faith as a free gift of God’s love and not through works (Ephesians 2: 8). Conversely, Islam teaches that salvation is obtained by obedience to the requirements of Allah and if God wills it, he will accept you. The sinner is not directed to Jesus Christ who takes away the sins of the world. Because of all these differences and many others, I am obliged to reject the Koran and accept only the Bible as the infallible word of God. Believing in Taurat, Zabur and Injil is a very good thing, but you know belief in itself serves no purpose if one does not follow the teaching of these sacred books. So we would like to encourage you to take time and read these Scriptures. If you do not have a Bible at home, do not hesitate to contact us for a free New Testament, a portion of the Holy Bible (in different languages). We would like to give you all the help you need to understand the Word of God.